A celebration of anything magical and mystical! 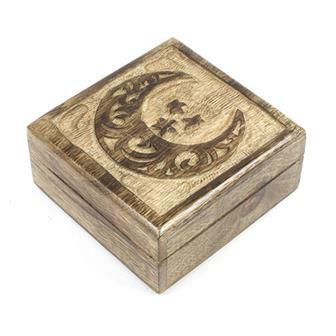 A large selection of occult, pagan, wiccan and magick items with all manner of pentacles, spell books and runes. 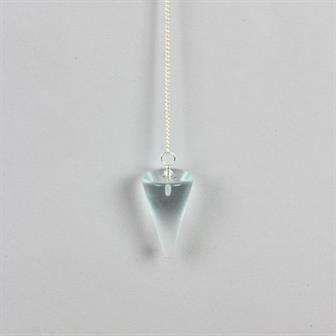 Also a great range of crystal pendulums. Ranging in colour from purple to mauve, these beautiful Amethyst pendulums are perfect for both divination and decoration. These beautiful Blue Obsidian pendulums are perfect for both divination and decoration. Obsidian is actually a volcanic glass that is formed when lava cools rapidly in certain areas. These beautiful Black Obsidian pendulums are perfect for both divination and decoration. Obsidian is actually a volcanic glass that is formed when lava cools rapidly in certain areas. 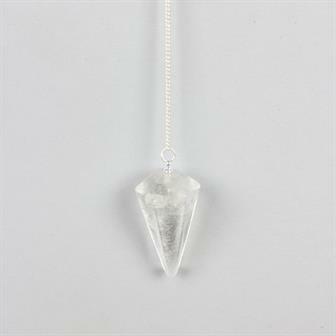 These beautiful clear Quartz pendulums are perfect for both divination and decoration. The Ancient Greeks valued quartz and referred to it as 'kruos' which translates as 'icy cold,' believing it to be a form of supercooled ice. 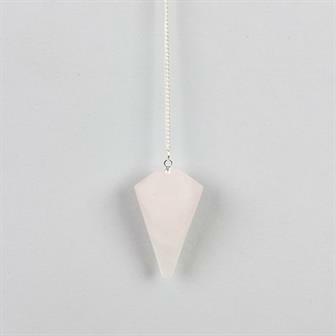 These beautiful Rose Quartz pendulums are perfect for both divination and decoration. Rose quartz is formed when other trace elements are present such as iron, manganese or titanium. 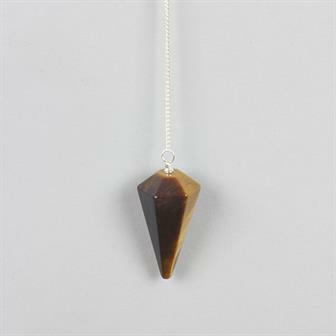 These beautiful Tigers Eye pendulums are perfect for both divination and decoration. The gemstone's fascinating appearance is caused by the interspersion of iron ore in the quartz formation. 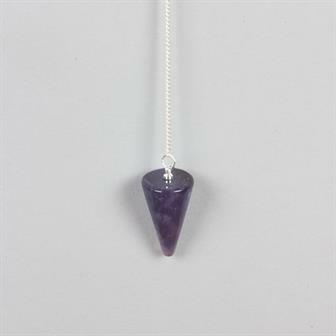 These beautiful Amethyst cone shaped pendulums are perfect for both divination and decoration. Amethyst is a variety of quartz that is purple to mauve in colour due to the presence of iron and other trace elements during formation. 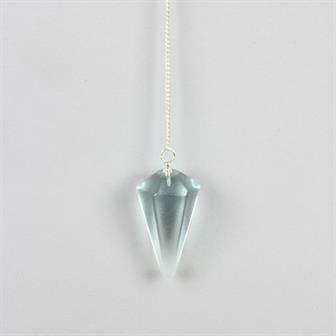 These beautiful Blue Obsidian cone shaped pendulums are perfect for both divination and decoration. Ranging from black to dark blue in colour, obsidian is actually a type of natural glass formed in cooling lava flows in certain areas. These beautiful Black Obsidian cone shaped pendulums are perfect for both divination and decoration. Ranging from black to dark blue in colour, obsidian is actually a type of natural glass formed in cooling lava flows in certain areas. 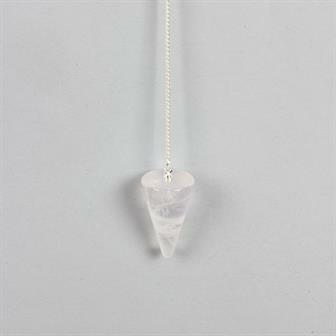 These beautiful clear Quartz cone shaped pendulums are perfect for both divination and decoration. The second most abundant mineral after feldspar, quartz has long been admired for its attractive appearance. 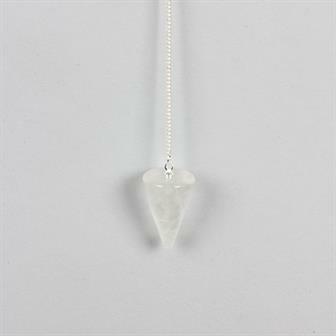 These beautiful clear Quartz cone shaped pendulums are perfect for both divination and decoration. The rose quartz variety gets its colouration from the presence of iron and other trace minerals at formation. 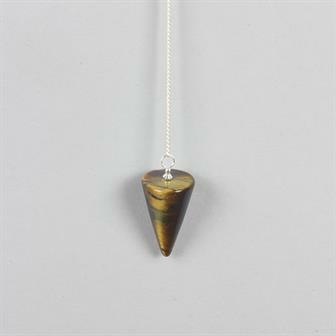 These beautiful Tigers Eye cone shaped pendulums are perfect for both divination and decoration. The Tigers Eye effect is caused by bands of iron ore being present at the mineral's formation. 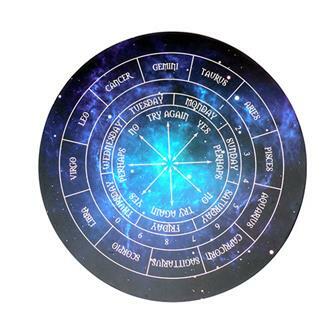 These divination boards are used in conjunction with crystal pendulums. These wonderful turned mango wood pendulum display stands are ideal for showing off your collection of pendulums. The stands have space to hold the chains of 24 pendulums. 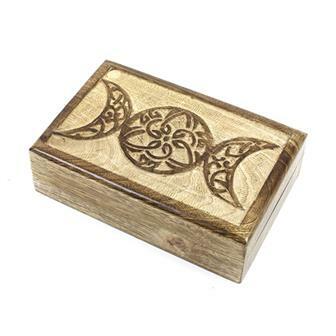 Each stand is handmade in India using fast growing mango wood which has a beautiful dark grain. 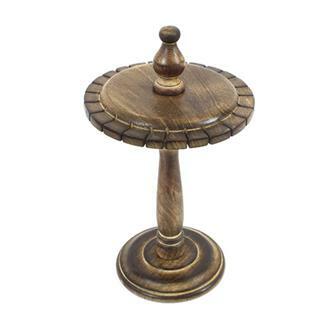 The attractive mini table are hand made from fast growing mango wood in India. 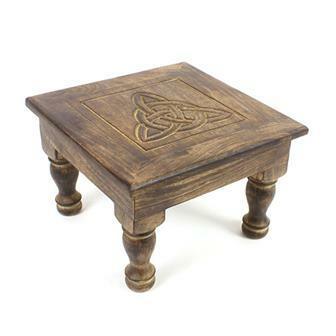 They are ideal for use as a Pagan/Wiccan altar table and they are available in three designs: Pentacle, Triple Goddess and Triquetra. These tables are perfect to create a raised area for prayer, to place items of importance or as an interesting side table. Interesting chalice shaped wooden crystal ball holder in a rich dark red stain and etched with a pentacle design. 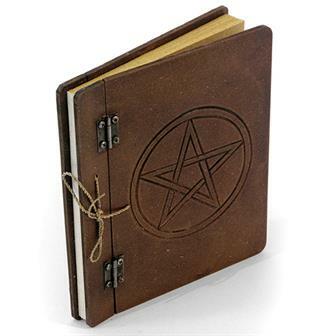 This rustic looking note pad is perfect for using on the go, recycled plain paper is encased in a sturdy thick board and decorated with a pentacle carving. The book is then bound with twine and metal hinges, that have been aged to add to the vintage effect. 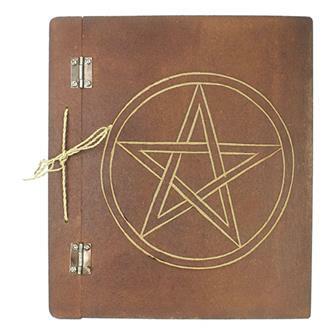 This rustic looking note pad is perfect for using on the go, recycled plain paper is encased in a sturdy thick board and decorated with a pentacle carving. The book is then bound with twine and metal hinges, that have been aged to add to the vintage effect.